If you lose one or more of your natural teeth, one option for their replacement is a dental bridge – which literally bridges the gap left behind by tooth loss. A bridge is a common, affordable, time-tested, and low-risk way to replace missing teeth and restore your smile and self-confidence. Costs are listed on a ‘per unit’ basis, with each abutment (anchor) tooth and each pontic (replacement tooth) counted as a separate unit. For example, a traditional three unit bridge would consist of two abutment teeth on either side of a gap, plus a single pontic in between. The cost of Maryland bridges are based on the number of wings and number of pontics. For a Maryland or resin-bonded bridge you can expect to pay between $250 and $600 for each wing while each pontic will cost $500 to $1,100. A typical Maryland bridge with two metal wings and one pontic is $1000 to $2300. The average cost of a traditional or cantilever bridge is between $750 and $1500 per unit. A typical three-unit bridge would be $2250 to $4500. The cost of an implant supported bridge depends on the size of the bridge, the materials used and the number of implants required. A typical three or four-unit implant supported bridge can cost from $4,000 to $16,000 (average of $8500). You can expect to pay more if you choose an all-ceramic Maryland bridge which has a zirconia substructure. Your dental insurance may cover up to 50% of the price of a dental bridge, up to a yearly maximum of $1000 to $2000. Unfortunately, some insurance companies have clauses that state that you have to be a on the plan for a minimum amount of time (ex. 2 years) before it will cover the procedure. fixed dental bridge is a common dental appliance that is cemented in position and can only be removed by your dentist. It can be used to replace a single tooth or multiple missing teeth. A bridge is anchored in position by crowns that cover the two natural teeth adjacent to a gap of one or more missing teeth. These anchoring teeth are called abutment teeth and must be ground down and reshaped so the crowns will fit securely. The abutment teeth support the replacement teeth, each of which is called a pontic. The pontics rest on the gums and provide a natural appearance. Bridges can be made from several different materials. The substructure is typically made of a precious metal alloy which is completely covered with porcelain (the outer layer that looks and feels similar to a real tooth). Other bridges are completely metal free. They have a substructure made of zirconia (an extremely hard ceramic) which is then veneered with a special type of porcelain. , Silver and Metal Alloys: the most durable, longest lasting and require the least amount of modification of a patient’s natural teeth. The primary drawback is that they don’t look at all like normal teeth. They are most often used to replace molars because they are hidden from view and need to withstand a lot of wear and tear. All-Porcelain: provides the most lifelike appearance. Unfortunately, they are not as strong as metal and they require more modification of the abutment teeth. Porcelain-Fused-to-Metal: combines the strength and durability of the metal base with the natural appearance of the porcelain outer shell. However, the porcelain will gradually erode over time, which can produce a smile with a slight grey tint. Zirconia: This high-end dental ceramic is the best of both worlds. Zirconia is almost as strong as a metal alloy, requires minimal alteration, can made to match the color of a patient’s teeth and has a semi-translucent appearance – just like the enamel on a natural tooth. The type of bridge used depends on: the location of the tooth, the condition of the adjacent teeth and your overall oral health. Your dentist will recommend the most appropriate choice for your situation. Traditional Bridge: A traditional bridge is held in place by abutment teeth on each side of the gap created by the missing tooth. These teeth are crowned and attached to the pontic/replacement tooth. 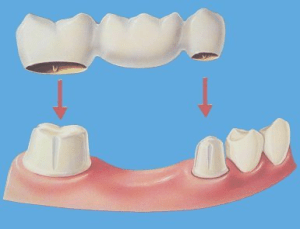 Cantilever Bridge (one-sided): This type is used when a patient only has natural teeth located on one side of the gap. The teeth on the other side may be missing completely or might not be healthy/strong enough to support a bridge. This type should not be used for molars as it places a lot of pressure on the abutment tooth. 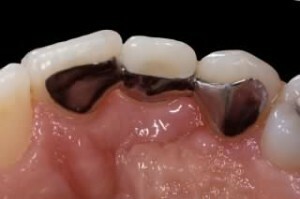 or Resin Bonded Bridges: These bridges are supported by ‘wings’ (instead of crowns) attached to adjacent teeth. The wings are cemented into position on the back surfaces of the adjacent teeth and can be made to match the color. Minimal alteration is required – your dentist will only need to remove a very small amount of tooth from the back surfaces of these teeth to make room for the wings. Maryland bridges can only be used in certain circumstances and are not suitable for replacing molars since they are subjected to strong chewing forces. Implant Bridges: These bridges are supported by dental implants that are surgically inserted into the jawbone. An implant bridge is the ideal solution if you do not have the number or strength of teeth required to support a bridge or if you would prefer not to have your healthy teeth reshaped and crowned. You may want to compare implants and bridges. First, your dentist will prepare the abutment teeth. This is done under local anesthetic as the teeth need to be ground down and reshaped. A significant portion of the teeth must be removed to create enough room for the crowns so that they don’t look or feel too bulky after they are permanently cemented into position. Once the teeth have been prepared, your dentist will take a detailed impression of them using a special putty-like material. This impression is then sent to a laboratory where it is used to fabricate a custom bridge. After taking the impression, your dentist will protect the prepared teeth and your gums with a temporary bridge. Once the bridge arrives from the dental lab, your dentist will check that it fits properly in your mouth. If it is a particularly large or complex bridge, your dentist may test the fit in the framework initially so they can make any adjustments necessary to obtain a proper fit. The framework is then returned to the dental laboratory so the bridge can be covered with porcelain. The final step is to have the finished bridge placed in the patient’s mouth and adjusted as necessary. Once both you and your dentist are satisfied, it is be cemented in position. A temporary cement may be used initially to allow you to wear the bridge for a couple of weeks to test if any further adjustments are necessary before the bridge is permanently cemented in place. A bridge shouldn’t be painful at all. That said, you may experience slight discomfort and tooth sensitivity after the abutment teeth are prepared, and it might take a few days to become accustomed to your new bridge as all new dental appliances (braces, crowns, etc.) can feel a little strange at first. If you experience more than a little bit of pain and/or it lasts more than a few days, contact your dentist so they can diagnose the problem and adjust your bridge if necessary. Recovering from the placement of a dental bridge should be easy and straightforward and as mentioned above, discomfort should be minimal. Once it is permanently cemented in place, your new bridge should soon feel very natural. It is important to take good care of your bridge as this will prolong its life and helps ensure the abutment teeth remain healthy and strong. A bridge needs to be brushed at least twice a day and flossed once per day – just like regular teeth. Your dentist can show you how to use a floss threader to clean underneath the pontics or you can use small interdental brushes. They typically last from 5 to 7 years. Good oral hygiene, regular checkups and professional cleanings help prolong the life of a bridge and can help it last 10+ years. If you’ve had a dental bridge done, I’d love to hear about your experience! How much did it cost? Were there any complications? Was it painful? Let me know in the comments. I’ve just been quoted just under $5000 for a 3 unit fixed bridge (2 anchor crowns + pontic) to replace a missing tooth on the upper-right side of my mouth. My insurance is going to pay the maximum of $2000 like you mentioned. I feel like this price is too high based on this article? Is my dentist just taking advantage of my insurance policy? I live in Wisconsin, if that makes any difference. Thanks!